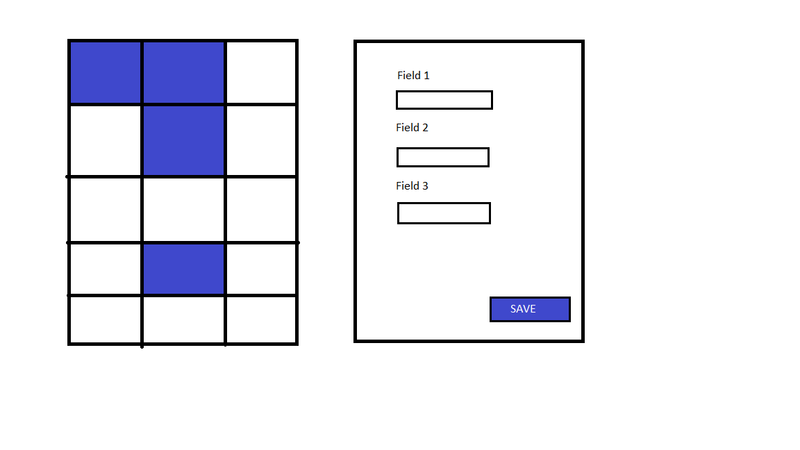 Suppose I have a screen with 2 elements: a selection table and a form. I am able to select elements from the 2d table like structure and upon selection the item's properties would appear in the form, the inputs can be edited and upon save the properties are saved. 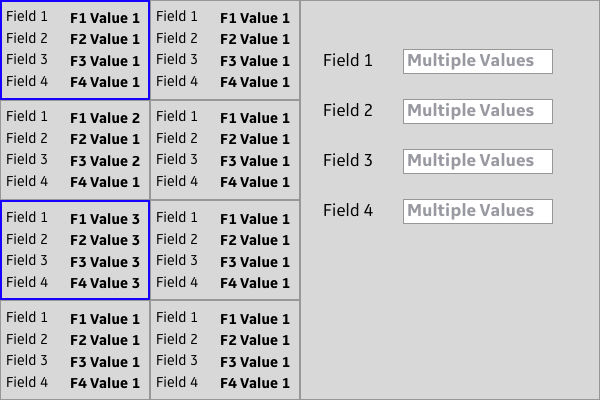 leaving a field as is for all the elements in the selection but modifying other fields. In both cases I would be tempted to leave the field empty, as it was presented, but upon save how is one to differentiate between the 2 cases? Also would there be an alternative to this? 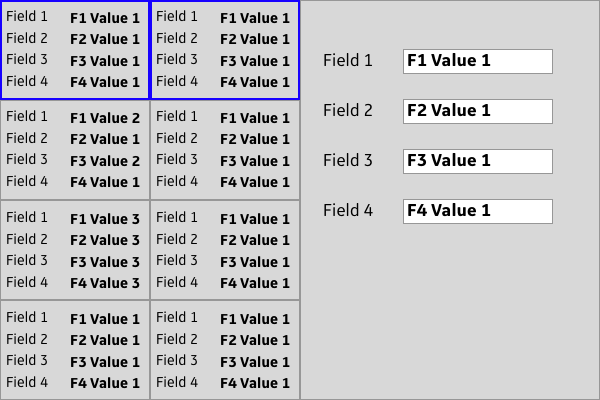 It was thought about showing the multiple selection's properties in a grid/table format, where you can check all the fields for all the entities selected, among other things. If I'm understanding your question correctly I might have some ideas. This one is hard. Like you say in the comments, you leave the input blank when the values are not the same. I've seen this pattern before, but I can't remember where. I'm familiar with it and if only I could remember what it was, I might be more confident in saying if this is convention or not. But fact is, in my opinion, this is a viable solution. But how do you empty an empty input field? I think the only solution is to add a button/link next to or below the input that says something like empty or remove. I've done something similar to this. My solution was to detect changes to the input. If an input was touched I removed a classname that was called pristine and added .dirty instead. I only updated values from "dirty" input fields. Fields can indicate the state of selection with text displayed differently so that user can quickly comprehend that values vary among the objects. 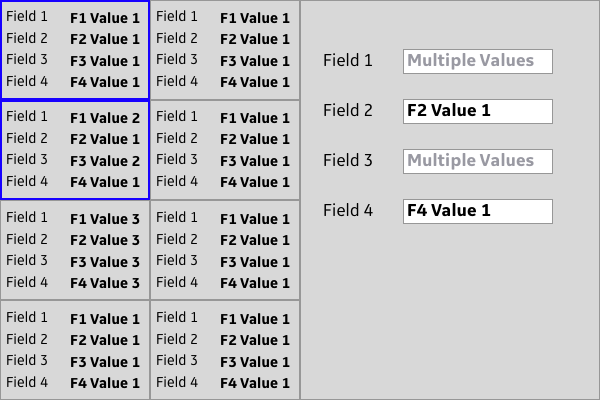 Clicking in the field would clear the message - "Multiple Values" in this case - so that user could enter a value that all of the selected objects would then share for that field. Might use "Different Values" If trying to cover states where some fields are blank as "different" doesn't connote existence/non-existence of data. Not the answer you're looking for? Browse other questions tagged forms multi-selection or ask your own question. How to make mass mutation intuitive?